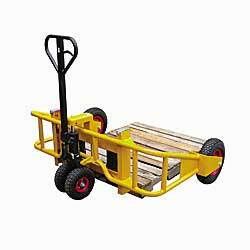 Transports cargo safely over rough terrain, snowy ground, or uneven surfaces. Large 17" front and 10" rear pneumatic wheels reduce effort needed to start truck on its way. Extra wide outriggers allow trucks to surround pallet for maximum load stability. Straddle inside width: 48". 4"W adjustable forks can be set anywhere between 9-1/2" and 26"W. 300° steering arc. 2,000-lb. capacity at 12" load center; 1,500-lb. capacity at 15" load center. Lightweight steel tubular frame and sealed wheel bearings offer long life. 49"L x 66"W overall. Painted yellow finish. FOB INDIANA. WA-0030 410	 9-1/226 x 32"	 39"